Apple Unveils iPhone 5, all new iPod nano, iPod touch and iTunes 11. Today, 12 Sept 2012 (13 Sept, 1am), Apple has unveiled to long awaited new iPhone 5. Though the design seem similar to the previous generations, iPhone 4 and iPhone 4S, but overall, it is different with the backing with slate (black) or silver (white). So what does it feature? 1. Taller 4 inch display. 5. 3 Microphones for better audio. It will firstly be available in 9 countries, United States, Canada, United Kingdom, France, Germany, Australia, Japan, Hong Kong, Singapore on Sept 21. It will also be available in more countries on Sept 28. Features a different form factor, with a 2.5 inch display and video features that was lost in the 6th Generation. One great thing added is the capability to support Bluetooth which should be great when using it for fitness with a wireless headphones and the Nike+ pedometer built in. It will come in 7 colours. It will feature the same 4-inch retina display with an A5 chip. It does not feature any LTE but will have a aluminum backing, away from the previous generations for the chrome-mirror effect. By having the aluminium backing, it will have 5 different colours to go around. With colours, this will have a strap, called "iPod touch loop". This forms a security when taking photos and preventing accidentally drop. 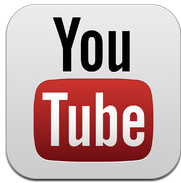 Since with the iOS 6 Beta 4, Apple has removed the native YouTube app, which could be quite troublesome for some and have to use the browser to navigate through YouTube. Some browsers, like the Google's Chrome and Apple's Safari, does not really support full-screen support. 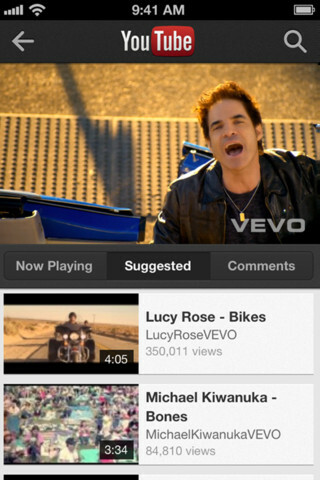 The new YouTube app, is now able to be in full screen when you rotate the iPhone, which is a thumbs-up. You can now 'Like', 'Dislike' and 'Share' at the same time. 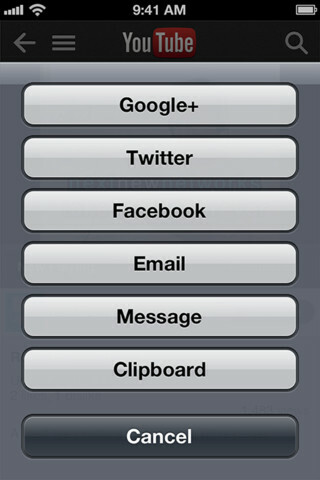 With 'Sharing', you are able to Google+, Twitter, Facebook, Email and you are able to Message now. 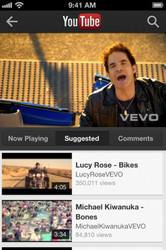 Some dislikes like, there is no toggle for the resolution for the videos playing. Sometimes when your Wi-Fi network may have a slow down, your video is going to buffer for a long time before it can be played. However, this YouTube App only supports for iPhone and iPod. The iPad version will be coming out in the months (soon). You can still download this as an iPhone app. The video resolution, isn't that too bad. 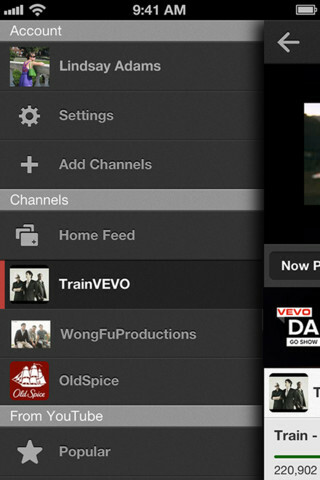 Overall, a nice UI and user experience for all to try it out. 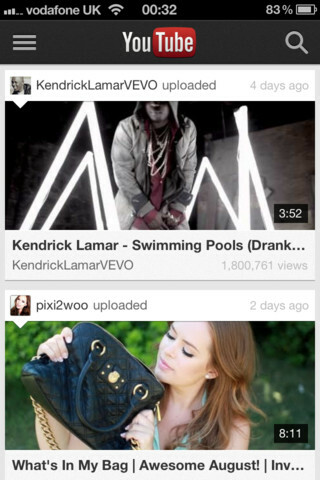 If you are on iOS 6, it is all the more that you should download it to enjoy the YouTube experience. 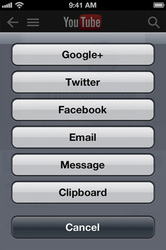 If you are on iOS 5, why don't you try it out before iOS 6 hits the iPhone soon. Credits: iTunes Store for Pictures, App Store, Google and YouTube App. Finally, the iPhone 5 event is going to be here soon. So what are we are going to get based on the rumours? 1. 4 inch taller display. 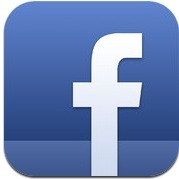 It seems to be faster for both the software that is running the new Facebook App for both platforms. We've rebuilt the app so it’s faster and easier to use. Chrome Browser hits the iPhone, iPod touch and iPad. Stop wondering and try it out. It's FREE. It is all the more that you should download it. It has become the No. 1 app within a few hours! Apple TVs hits Singapore and 8 other countries. With the release of the iTunes Music yesterday, Apple has released the Apple TV, able to play Music and Movies right from your big television display. 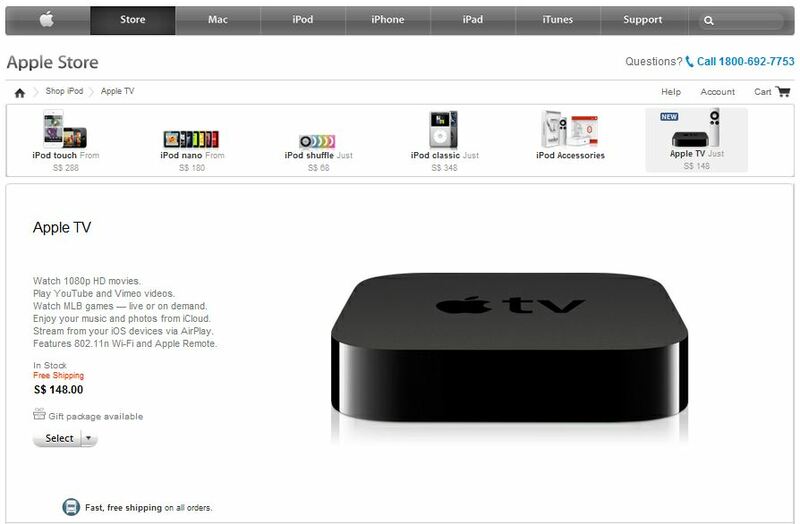 The pricing for the Apple TV is at S$148 (as shown below). It will be available starting from today and probably soon in local distributor stores here. iTunes Music lands in Singapore and other 11 countries. It is time, the wait is over. Singapore and other 11 countries are getting the Music, Movies and Music Videos. The prices for the Music are relatively set at S$1.28 and Movies are mostly priced at S$4.98 for Rent and $19.98 for the Car 2 film. The iTunes store is also launched in Hong Kong, Taiwan, Brunei, Cambodia, Laos, Macau, Malaysia, Philippines, Thailand, Sri Lanka and Vietnam. As you enter the Apple (SG) website, you will be greeted with the iTunes Music cover. 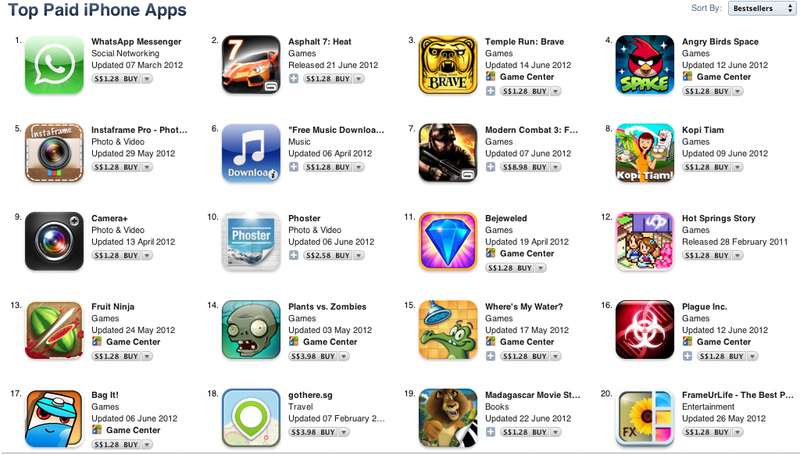 Since Apple has introduced the App Store to another 32 countries, I guessed that Apple didn't forget about Singapore. It has now updated from the US$0.99, US$1.99, US$2.99 and etc to the all new S$1.28, S$2.58, S$3.98 and etc. It seems that some of the Apps are cheaper when Apple used the SGD in comparison to USD that we have been paying since Apple launched the App Store back in 2008. However, the difference is minimal from S$0.10 to S$0.40 (or even more, depends). The price seems to be fixed, unlike Android whereby the prices would change regularly in due of the exchange rates. Apple on June 11 introduced and made changes to the following hardware and software. 2) Changes to the MacBook Pro 13 inch [Low End: 2.4 to 2.5 GHz; High End: 2.8 to 2.9 GHz and comes with 8GB RAM] and 15 inch [Increased GHz]. 3) All New MacBook Pro with Retina Display. 4) iOS 6: Facebook Integration, Siri now supported for sports scores, restaurants and multi-languages, FaceTime over celluar, Phone app: able to remind you to call the person later or send a text message 'I'm busy, call you later' & Maps app: 3D Maps, Turn by Turn Navigation. 5) OS X Mountain Lion: iCloud - Notes and Reminders. Power Nap and Safari improvements (added the website bar + search bar). 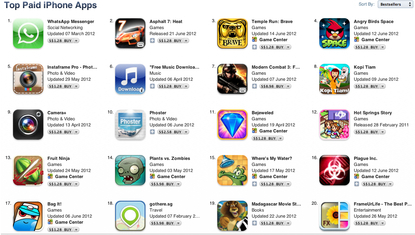 Mountain Lion will be available in July for just $19.99 through the Mac App Store. iOS 6 is available this fall (Sept/Oct) and is available for Developers today. All new MacBooks mentioned at the WWDC 2012 is available today! Find out what we have reviewed about its Hardware and Software! Apple Releases iOS 5.1.1. Fixes Various Bugs and Improves Reliability. You can update to the iOS 5.1.1 firmware via iTunes, or update over-the-air via Software Update on your iOS device. Which came first? iOS or Android?